GATRAD CAL-TEST LABORATORIES AND RESEARCH PVT. LTD., is accredited to ISO/IEC 17025:2005 requirements and specific criteria laid down by NATIONAL ACCREDITATION BOARD FOR TESTING AND CALIBRATION LABORATORIES (NABL), vide Accreditation Certificate Nos. C-102 for Mechanical, C-336 for Electro-Technical and C-337 for Thermal, in the field of Calibration. 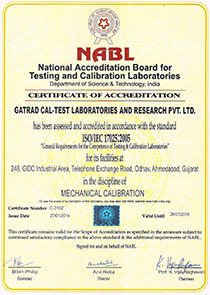 As GATRAD is accredited by NABL as per ISO/IEC 17025:2005, Calibration performed and Certificate issued by GATRAD are accepted world-wide, and amongst all MRA signatory countries. NABL maintains linkages with the international bodies like International Laboratory Accreditation Co-operation (ILAC) and Asia Pacific Laboratory Accreditation Co-operation (APLAC). NABL is a full member of ILAC and APLAC and regularly takes part in their meetings. More information on this international cooperation can be obtained from their web-sites www.ilac.org and www.aplac.org respectively. NABL is signatory to ILAC as well as APLAC Mutual Recognition Arrangements (MRA), which is based on mutual evaluation and acceptance of other MRA Partner laboratory accreditation systems. Such international arrangements facilitate acceptance of test/ calibration results between countries, which MRA partners represent. The information on ILAC and APLAC Mutual Recognition Arrangements (MRAs) is available at NABL website. On request from the laboratories or their users, a copy of ILAC/ APLAC MRA is provided. 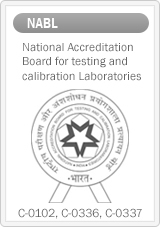 In order to achieve the objective of the acceptance of test/ calibration data across the borders, NABL operates and is committed to update its laboratory accreditation system as per international norms. NABL operations conform to ISO/ IEC 17011: 2004.